Tesla recently completed its supercharger network along a cross-country route. Click on map to see where superchargers are planned next. Tesla owners can now drive across the country using the company's network of charging stations to power their batteries -- as long as they don't mind going about 800 miles out of their way. In a publicity move, two teams of Tesla employees left L.A. late Wednesday and hope to make it to New York in three days. But they won't be taking the most direct route. 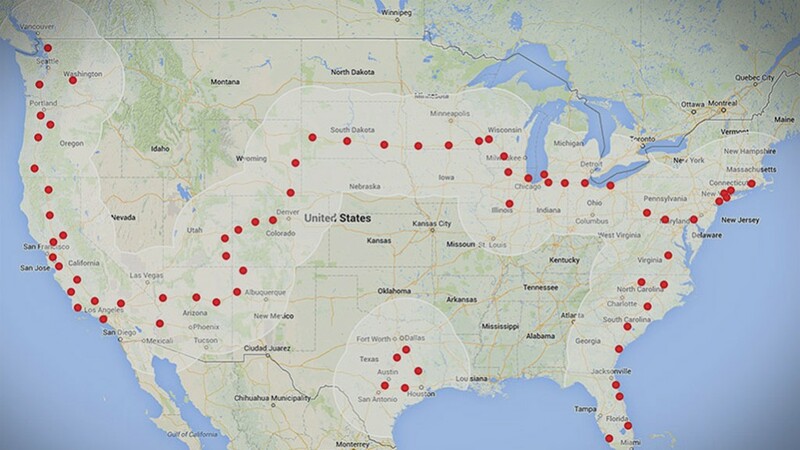 Tesla's transcontinental network of "superchargers" is spread across about 3,600 miles, according to Google maps. More than 600 of those miles are on smaller highways, not interstates. Tesla says the route along its network is closer to 3,400 miles long. Either way, that's longer than the most direct way across the country -- about 2,800 miles. The Tesla path detours much farther north, taking drivers near Mt. Rushmore but adding hundreds of miles. Even after it joins up with a more direct northern route, Tesla's trip then swings down to superchargers in Maryland and Delaware, before heading up the New Jersey Turnpike, a frequently congested road that more direct routes essentially avoid. Tesla says it is adding about one supercharger station a day and by late this year drivers will be able to take more direct routes. It is investing in the superchargers, which are free for Tesla owners, as a selling point. 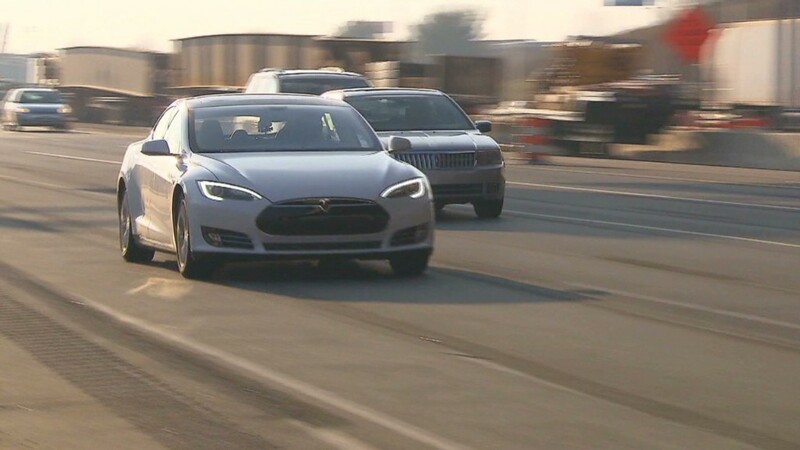 Tesla owner John Glenney of Lexington, Ky., and his daughter Jill reported in an online forum that they were the first to make a cross-country trip using nothing but the superchargers, completing the trip last weekend. And Tesla will get more publicity for the route later this spring when CEO Elon Musk plans to hit the road with his five sons. Musk has joked the journey will be like fictional dad Clark Griswold's road trips in the "Vacation" movies. Of course, there's an even quicker way to get from Los Angeles to JFK Airport in New York, the East Coast end point of the cross-country network. It's called flying.